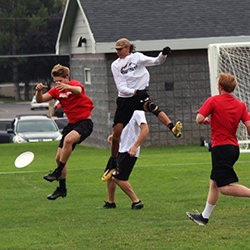 Since the early 1970s, ultimate Frisbee, played with a flying disc, has exponentially increased in interest among college students and young athletes. It’s a limited contact sport that combines elements of soccer, football and basketball. Players must run, cut, guard, jump, throw, and dive with outstretched arms to catch the flying disc. Because of the intricate movement patterns and high level of endurance required in flying disc games, this sport can sideline any athlete with injuries. A study of “Injuries from Ultimate Frisbee” published in the U.S. National Library of Medicine National Institute of Health, 135 adult ultimate Frisbee athletes reported injuries, including muscle strain, ankle, knee, shoulder, and rib injuries. Seventy percent of the players have sought medical care for ultimate Frisbee injuries. Recurrent injuries occurred with 49% of the athletes. The DOC orthopedic surgeons, specialty trained PAs and physical therapists are sports medicine experts for musculoskeletal sports injuries, such as injuries associated with ultimate Frisbee. The ultimate Frisbee tournament calendar is e-published at play.usaultimate.org.